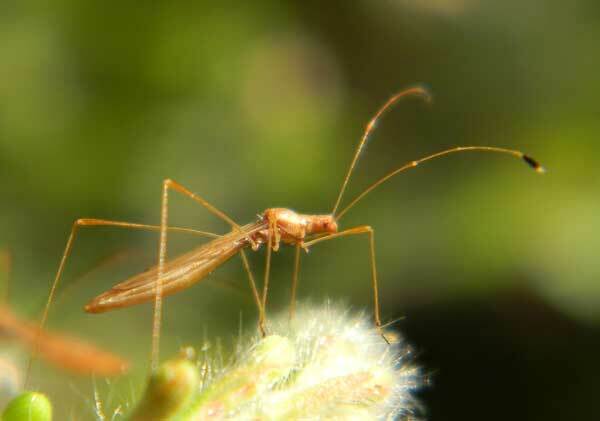 Stilt Bugs are plant feeders and are rarely abundant enough to cause any serious damage to crops or garden plants. The feed almost exclussively on buds and developing seeds using their equally long and slender mouth parts as drinking straws. There are several species belonging to this genus that require magnification for accurate identification. However, some species are known to cause damage to cultivated tobacco and fruit tomatoes. The long legs may serve these insects by alerting them to an imminent attack. Copyright Michael J. Plagens, page created 12 July 2011, updated 19 April 2014.